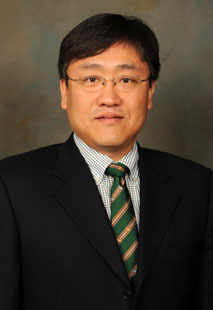 Hongseok Choi joined the Department of Mechanical Engineering as an Assistant Professor in August 2013. He earned his Ph.D. in Mechanical Engineering from the University of Wisconsin-Madison in 2007, and has worked as an Assistant Scientist in Nano-Engineered Materials Processing Center (NEMPC) at the University of Wisconsin-Madison. Dr. Choi’s expertise lies at the solidification nanoprocessing, micro/nano sensors, ultrasonic joining, laser materials processing, and additive manufacturing. He has published 32 referred journal articles, 28 peer-reviewed conference proceedings, and invented 2 patents and had 7 invention disclosures in progress. Dr. Choi currently serves as reviewers in the Journal of Manufacturing Processes, Journal of Materials Engineering and Performance, Metallurgical and Materials Transactions A, Sensors, and IEEE Transactions on Automation Science and Engineering. He is a member of ASME, SME, and TMS. Chen, Lianyi; Peng, Junyang; Xu, Jiaquan; Choi, Hongseok; Li, Xiaochun, “Achieving Uniform Distribution and Dispersion of a High Percentage of Nanoparticles in Metal Matrix Nanocomposites by Solidification Processing,” Scripta Materialia, 69(8), 634-637 (2013). Li, Hang; Choi, Hongseok; Ma, Chao; Zhao, Jingzhou; Jiang, Hongrui; Cai, Wayne; Abell, Jeffrey A.; Li, Xiaochun, “Transient Temperature and Heat Flux Measurement in Ultrasonic Joining of Battery Tabs using Thin-film Micro Sensors,” Journal of Manufacturing Science and Engineering, 135, 051015 (2013). Estruga, Marc; Chen, Lianyi; Choi, Hongseok; Li, Xiaochun; Jin, Song, “Ultrasonic-Assisted Synthesis of Surface-Clean TiB2 Nanoparticles and Their Improved Dispersion and Capture in Al-Matrix Nanocomposites,” ACS Applied Materials & Interfaces, 5(17), 8813-8819 (2013). Choi, Hongseok; Cho, Woo-hyun; Konishi, Hiromi; Kou, Sindo; Li, Xiaochun, “Nanoparticle-Induced Superior Hot Tearing Resistance of A206 Alloy,” Metallurgical and Materials Transactions A, 44(4), 1897-1907 (2013). Choi, Hongseok; Cho, Woo-hyun; Hoefert, Daniel; Weiss, David; Li, Xiaochun, “Scale-up Ultrasonic Processing System for Batch Production of Metallic Nanocomposites,” Proceedings of the 117th AFS Metalcasting Congress, American Foundry Society, St. Louis, Missouri (April 2013). Choi, Hongseok; Konishi, Hiromi; Li, Xiaochun, “Al2O3 Nanoparticles induced simultaneous refinement and modification of primary and eutectic Si particles in hypereutectic Al-20Si alloy,” Materials Science and Engineering A, 541, 159-165 (2012). Choi, Hongseok; Jones, Milton; Konishi, Hiromi; Li, Xiaochun, “Effect of combined addition of Cu and aluminum oxide nanoparticles on mechanical properties and microstructure of Al-7Si-0.3Mg alloy,” Metallurgical and Materials Transactions A, 43(2), 738-746 (2012). Choi, Hongseok; Sun, Yi; Slater, Ben; Li, Xiaochun, “AZ91D/TiB2 Nanocomposites fabricated by solidification nanoprocessing,” Advanced Engineering Materials, 14, 291-295 (2012). Choi, Hongseok; Konishi, Hiromi; Xu, Huifang; Li, Xiaochun, “Embedding of Micro Thin Film Strain Sensors in Sapphire by Diffusion Bonding,” Journal of Micromechanics and Microengineering, 17(11), 2248-2252 (2007). Choi, Hongseok; Li, Xiaochun, “Fabrication and Application of Micro Thin Film Thermocouples for Transient Temperature Measurement in Nanosecond Pulsed Laser Micromachining of Nickel,” Sensors and Actuators A, 136, 118-124 (2007). Zhang, Xugang; Choi, Hongseok; Datta, Arindom; Li, Xiaochun, “Design, Fabrication and Characterization of Metal Embedded Thin Film Thermocouples with Various Film Thicknesses and Junction Sizes,” Journal of Micromechanics and Microengineering, 16(5), 900-905 (2006). Choi, Hongseok; Datta, Arindom; Cheng, Xudong; Li, Xiaochun, “Microfabrication and Characterization of Metal-embedded Thin-Film Thermomechanical Microsensors for Applications in Hostile Manufacturing Environments,” Journal of Microelectromechanical Systems, 15(2), 322-329 (2006). Li, Xiaochun; Choi, Hongseok; Yang, Yong, “Micro Rapid Prototyping System for Micro Components,” Thin Solid Films, 420-421, 515-523 (2002).